Corporal S4/055503 Cecil Thomas Lake Taylor, 13th Division Field Bakery, Army Service Corps. 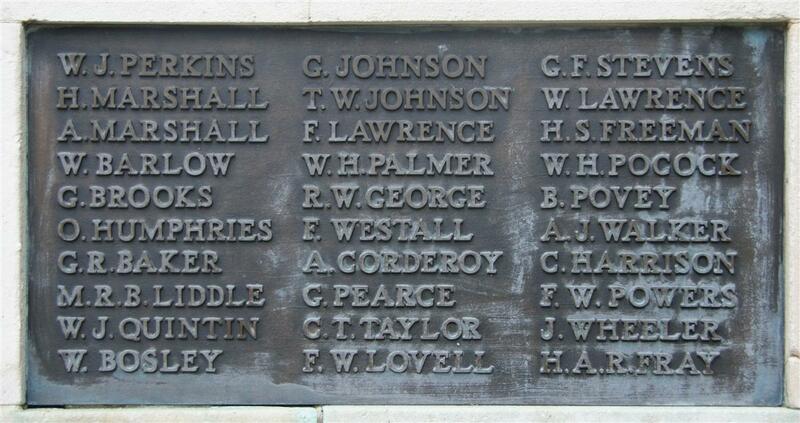 It is believed that there was some confusion in 1922 when the names to be commemorated on the Newbury Town War Memorial were collated. This resulted in C T L Taylor being commemorated twice, as C T Taylor on Tablet 5 and as T L Taylor on Tablet 13. Best efforts have failed to uncover a second Taylor from Newbury with either set of initials. Such confusion could result from multiple submissions of his name, for instance by his parents and a friend. The fact that both include the initial T suggests that he went by the name of Thomas or Tom. (1 Elm Villas at the time of the Great War). Thomas was born in Newbury in 1896 the son of Thomas Taylor and his wife Beatrice (née Lake). 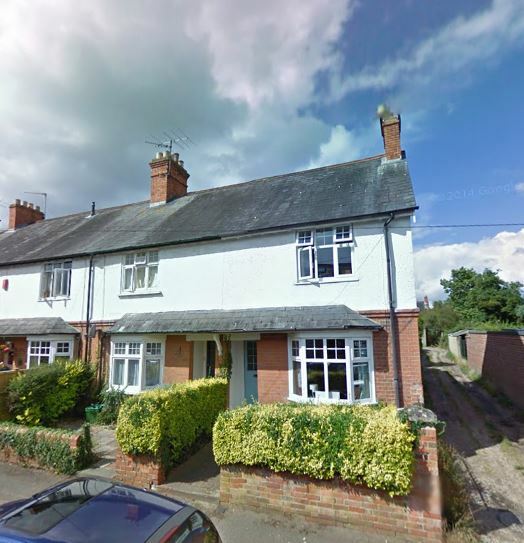 He was the couple’s eldest child, the next four, Leonard Leslie (born 1899), Doris Beatrice (1901), Reginald George (1903) and Cyril Dudley (1907) were all born in Reading where Thomas senior was working as a carpenter. The family moved to Newbury in 1909, to a recently built house in a new development on the western edge of town – 1 Elm Villas, Salcombe Road (now simply 1 Salcombe Road). A daughter, Marjorie Ethel, was born in 1911, in the family’s census return she is unnamed, listed simply as ‘girl’ aged 4 days. Following his schooling Thomas became a baker learning the trade with Mary Faulkner at her Padworth bakery and Mrs Robinson in Enborne Road (very close to home). When war was declared in August 1914 Thomas soon volunteered. Aged only seventeen at the time Thomas waited until his eighteenth birthday had passed before enlisting on 9 January 1916 where he passed the basic medical (which showed he was 5ft 6½ins tall). He was sent to Aldershot where he joined the Army Service Corps at Aldershot on 13 January. His skills were of great use to this organisation, which was responsible for keeping the troops supplied with all their needs, including, of course, bread. 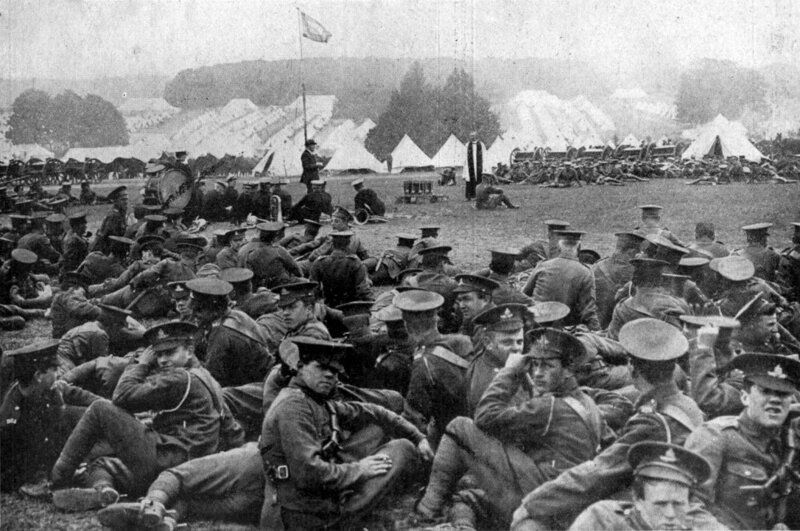 Troops of the 10th Division at Church Parade at their camp in the fields outside Basingstoke. He was posted to the 10th Division Field Bakery – which was not far from home at the time since the 10th (Irish) Division was in training at Hackwood Park outside Basingstoke. The division was made up of Irish troops, some of whom created a serious disturbance in Newbury when they were allowed into town one evening after a route march from Basingstoke to Newbury. Soon after this embarrassing incident the 10th Division was despatched to Egypt bound for Gallipoli. Thomas landed at Alexandria on 18 July 1915, two days later, while at Mudros on the island of Lemnos , he was promoted to Acting Corporal. On 22 August the division embarked for Gallipoli; the Field Bakery may have landed at Suvla Bay with the rest of the division, but it is also possible that it remained in safety at Mudros from where the forces on the peninsula were supplied. Thomas went overseas a few months before his nineteenth birthday – strictly speaking he should not have been sent into a theatre of war at that age; perhaps his role in a bakery was deemed safe enough for an underage soldier. 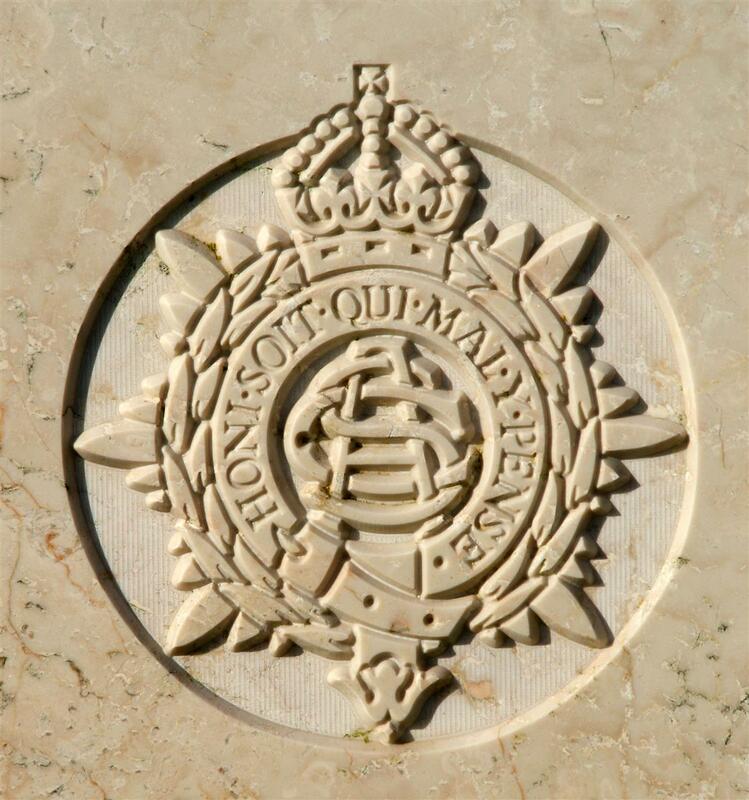 The regimental badge of the Army Service Corps, as used on CWGC headstones. The final troops were evacuated from Gallipoli in January 1916, but the 10th Division left earlier, in September 1915 it returned to Egypt and then in October, moved to Salonika where an Anglo-French force was sent, too late, to help Serbia resist invasion and stayed to battle a largely Bulgarian force. However, Thomas would not see Greece, instead he travelled via Port Said to Basra in modern day Iraq, then Mespotamia. It appears that the bakery was needed elsewhere. In Mesopotamia it became the 13th Division Field Bakery. Thomas arrived at Basra on 2 March where he was based until 25 May. He then transferred to the Indian Expeditionary Force heading north up the River Tigris to Sheikh Sa’ad, where the daily chore of supplying tens of thousands of men with bread continued. In the heat of the Iraqi summer work in a bakery was hot work – too hot for Thomas, who collapsed with heat stroke while at work on 19 July. He was taken to hospital (39th Field Ambulance) but died soon after. Mr and Mrs T Taylor, of Salcombe-road, are mourning the loss of their eldest son, Cecil, who died from the effects of heat in the Persian Gulf. This young fellow, realising his duty to King and Country, and the cause of freedom, offered his services soon after his eighteenth birthday. He had previously learnt his trade as a baker, having been with Mrs Robinson, of Enborne-road, Newbury. The Army Authorities found him useful in his trade, and in due course he was promoted to corporal. He saw service in Egypt, the Dardanelles, Mesopotamia, and last of all in the Persian Gulf. Tablet 5 of the Newbury memorial, with Thomas as C T Taylor. He was buried in Amara British Cemetery where his remains lie in grave XIII. J. 19. The graves in this cemetery are all unmarked (acid in the soil caused severe problems with headstones) so the names are recorded on a screen wall. As it is unadvisable to visit Iraq in these troubled times the men remebered at Commonwealth War Grave Commission (CWGC) cemeteries and memorials there are also remembered in a Roll of Honour available for public viewing at the CWGC office in Maidenhead, Berkshire. 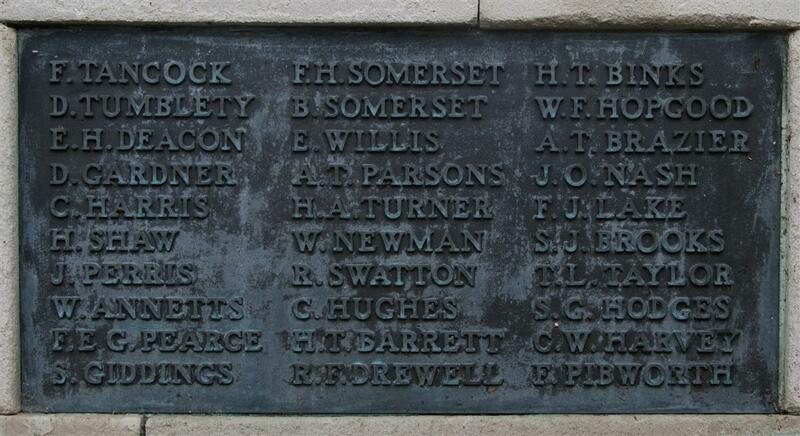 Locally he is (as noted above) recorded twice on the Newbury Town War Memorial, as CT Taylor and TL Taylor. He was also included on the Roll of Honour board at St John’s Church, Newbury, which was destroyed by an enemy bomb in 1943. Tablet 13 of the Newbury memorial, with Thomas as T L Taylor. Thomas’ younger brother, Leonard Leslie Taylor, was also caught up in the war serving first, in France, with the 2/4th Battalion of the Royal Berkshire Regiment (No 448844) and then the Hampshire Regiment (010683). As he was still with the Royal Berks in 1919 (when details of Thomas’ family were entered into his records) his service with the Hampshires was post war. He may well have re-enlisted (there was a sizeable bounty for doing so) and might even have served with the Hampshires in Iraq and/or Russia. He survived the war and died in Reading in 1959. Like this site? Show your appreciation through a donation to a great charity.